The Audio-Technica AT898 lavalier microphone is designed to be mounted on, or hidden underneath clothing. 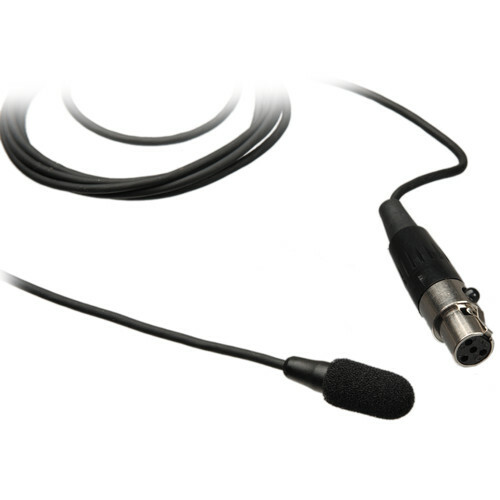 Its slim low-profile design is ideal for broadcast and theatrical applications. The tailored frequency response accentuates the frequency response of vocals while minimizing low frequency noise. A low-frequency roll-off switch further minimizes noise due to hum, ambiance and proximity effect. The AT898 features a condenser element with a cardioid polar pattern. The cardioid pattern is effective in minimizing noise and ambiance at the off-axis sections of the microphone capsule. Maximum Input Sound Level Phantom: 131 dB SPL, 1 kHz at 1% T.H.D. Box Dimensions (LxWxH) 5.9 x 4.3 x 1.4"